© 2005, Kevan HashemiOpen Source Instruments Inc.
S3006_1: Page One of A3006 Schematic, showing 1.8-V regulator, 32-kHz oscillator, logic chip, programming connections, 950-MHz oscillator, and reed switch. S3006_2: Page Two of A3006 Schematic, showing 16-bit ADC, 160-Hz low-pass filter, 1.6-Hz high-pass filter, and differential input. Bottom View: Black-and-white photograph of bottom-side of Subcutaneous Transmittter (A3006). The ruler graduations are millimeters. The transmitter circuit, with all its components, but not counting its antenna, measures 18 mm x 16 mm x 8 mm, for a total volume of 2.3 ml. 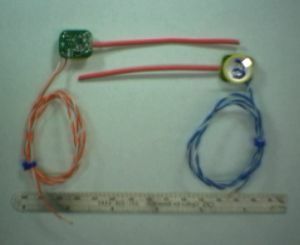 Pair View: Low-resolution color picture of two Transmitters with Analog Input (A3006). Note the red 75-mm antennas and the twisted pairs of wires for the differential analog input. These wires are too thick and stiff for easy use in an animal body, but they are strong, and therefore a better choice for initial tests. 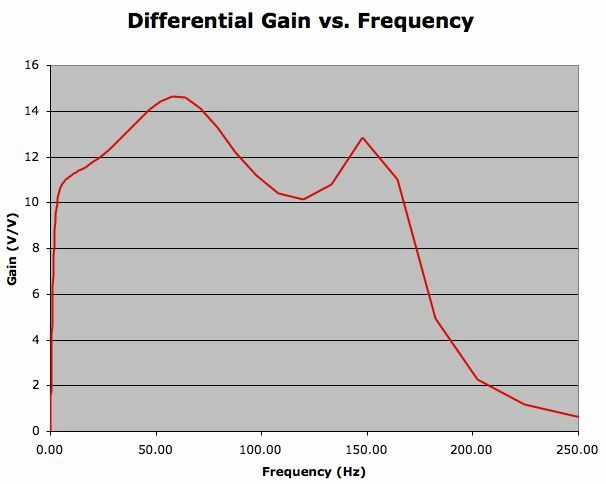 Calculated Analog Gain (Linear): Calculated gain of the input amplifier, including the effect of its high-pass and low-pass filters. This plot shows the frequency response in the pass-band with a linear frequency scale. 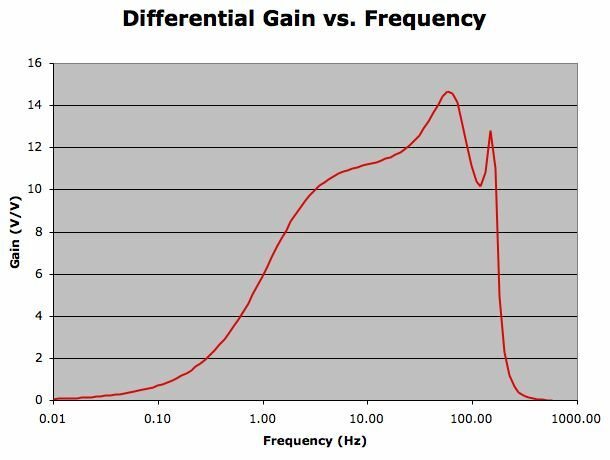 The gain is the differential gain between the differential input of the transmitter and the single-ended input of the ADC. A zero-volt differential input appears as a 1.8-V input to the ADC, and the ADC's input range is equal to the battery voltage, which is nominally 3 V. The peak gain of the analog signal path is 15 at 60 Hz (ideal for amplifying mains hum). To be sure of no saturation at the ADC input, the differential input amplitude should be less than 80 mV. The ADC resolution at the transmitter input is 3 μV at 60 Hz. But the thermal noise power at the 22-MΩ differential input impedance in the 160-Hz pass band is 8 μV. When we add OPA2349 input noise of another 8 μV. The noise on our ADC output will have standard deviation five or six counts. Calculated Analog Gain (Log): Calculated gain of the input amplifier, including the effect of its high-pass and low-pass filters. This plot shows the frequency response on a log scale. Firmware: Logic chip firmware. Transmits 512 times per second. Transmission consists of three start bits, a one-zero for punctuation, three protocol bits (protocol is 1), five bits to identify the transmitter, a one-zero for punctuation, the top eight ADC bits, a one-zero for punctuation, the next six ADC bits, and a two-bit checksum. We do not transmit the least significant ADC bits. The firmware calibrates its ring oscillator with respect to the precision 32-kHz oscillator when you turn on transmitter with a magnet. This calibration stops when you remove the magnet, leaving the reed switch open but the transmitter in the active state. The transmission speed is 4.194 MBits/s. The moment of transmission is delayed each time from its nominal moment by a number of periods of the 32-kHz clock given by the lower four bits of the ADC output. This prevents two transmitters whose 32-kHz clocks fall into synch with one another from obliterating one another's transmissions. Instead, the random nature of the noise on the analog input will displace each transmission by a random time, and the two devices will interfere with one another less than a quarter of the time. Battery Life: Transmitter 2 (ID is 2 in its data transmission) started continuous operation at the beginning of November 2005. Its battery voltage was then 2.9 V. At the beginning of February 2006, the battery voltage had dropped to 1.9 V, but the transmitter was still operating. We received its reference square wave signal from five meters away, and the signal was still strong enough to saturate the receiver output. A300201B.zip: Printed Circuit Board ZIP Archive.